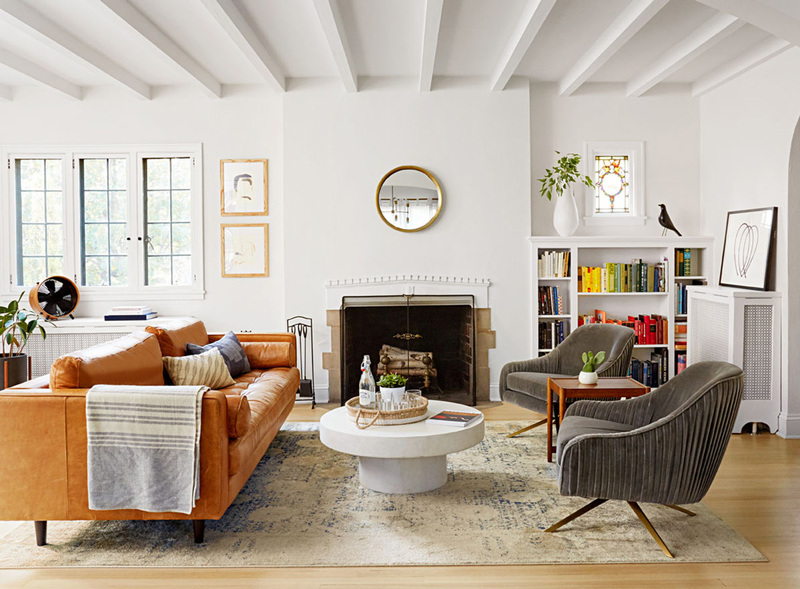 In her Tudor-meets-mod Saint Paul home, design consultant Kate Arends proves style can shine through, even in a world full of kids, dogs and other happy realities. The white couch was indispensable—critical to the look. At least until Winnie the Lab arrived. That’s when Kate Arends began to reconsider the relative importance of a contented pup, a happy family and a perfectly curated look. White was out, replaced by forgiving leather. Kate hasn’t wavered in her strong sense of style. It’s central to her career, which includes consulting for clients like Target and Warby Parker and running a blog that long ago graduated from hobby to business. But when she bought a home and started a family, she learned new lessons about downshifting from dream to reality. 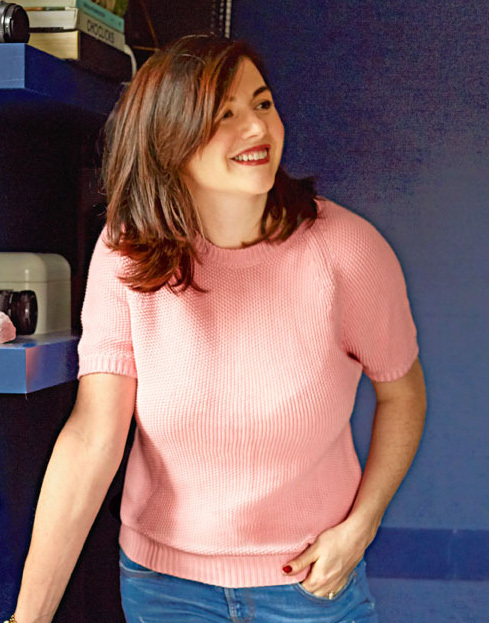 As Kate and her husband, Joe, have painted and furnished their Tudor (also not a first choice), they’ve learned to let their family’s needs lead the way. “We had to make decisions that weren’t going to make our house harder to live in,” Kate explains. “There’s nothing here so precious you’d be afraid to put a coffee cup on it.” Or a little dog hair. First-time homeowner. Design-rule bender. Mind behind the Wit & Delight blog—when not chasing baby August. 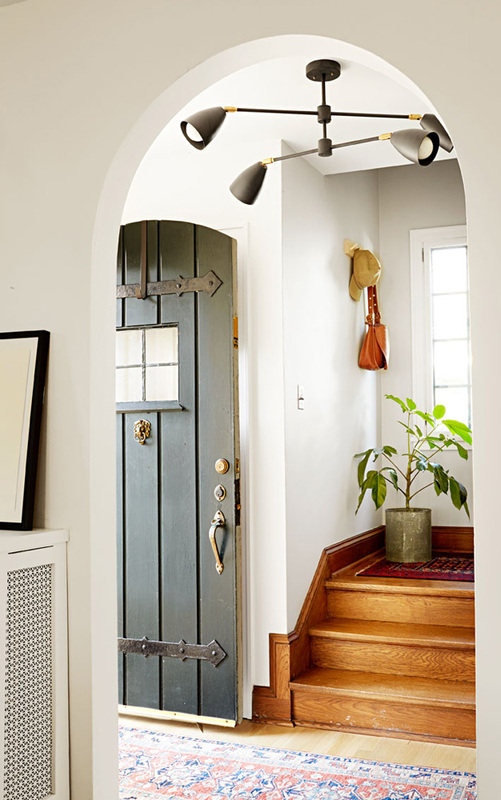 “There’s opportunity to be creative when you’re in a home that doesn’t reflect the style you had in mind,” says Kate, whose Hansel-and-Gretel door is a foil for her foyer’s mod light fixture. 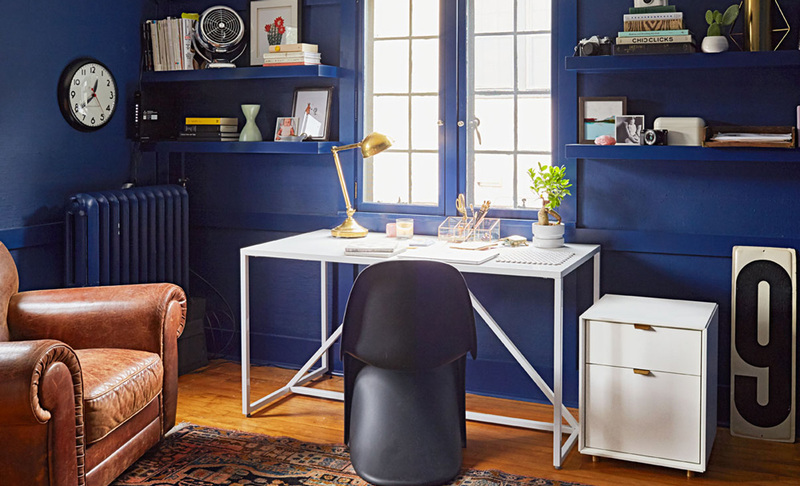 Kate wanted a home office that helped her make the mental switch to work mode. She used all-over dark paint to create a totally different space. Straying from convention, she saved time and money by painting directly over the grass-cloth wallpaper. Painting floating shelves the same color as the wall makes them feel built-in. When the couple moved into their home, Joe didn’t even fit in the breakfast nook. 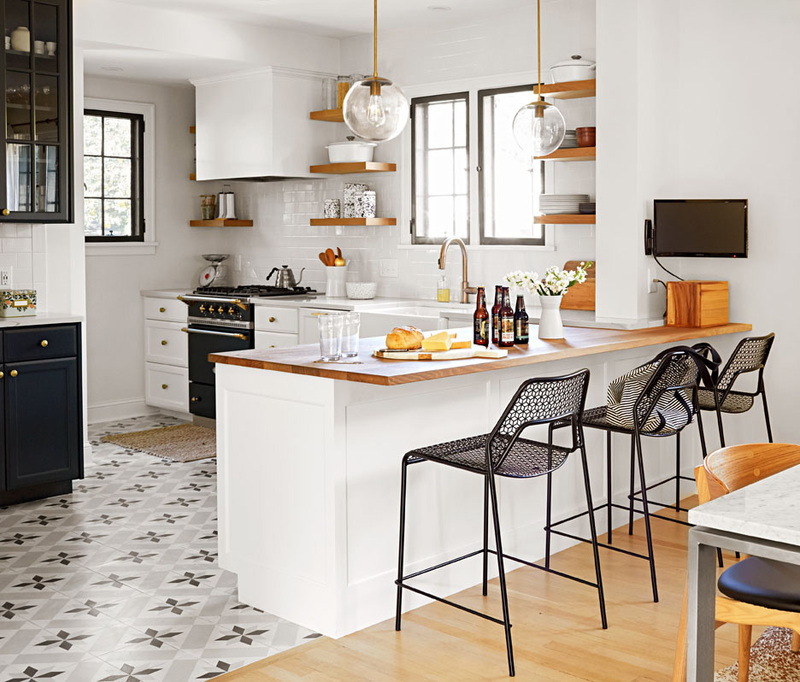 A renovation added handy open shelves and carved extra counter space out of the small kitchen’s footprint—both key features for Kate, who loves to cook. And she made sure that one dream-house fantasy did become reality: a worth-the-splurge LaCanche range. Kate says these Minneapolis shops were regular stops as she furnished her home. And lucky for you, they all sell online. The Foundry Home Goods It’s my favorite place to go for a pick-me-up. They’ve got great beeswax candles, so it always smells amazing when you walk in (thefoundryhomegoods.com). Forage Modern Workshop I love Forage for its access to modern products you’d often have to go to Copenhagen to get. They aren’t afraid to get a little weird or artistic (foragemodernworkshop.com). Blu Dot This affordable modern furniture shop has an outlet in Minneapolis where you can get good deals on floor models. If you’re lucky, you may also find one-of- a-kind prototype pieces (bludot.com). Read more about Kate's design ideas and find ways to incorporate them into your home at midwestliving.com/katestips. Contractor Jim McDonald, McDonald Remodeling. Inver Grove Heights, Minnesota (mcdonaldremodeling.com). Living room Chair Roar + Rabbit swivel. West Elm (westelm.com). Coffee table Shroom. CB2 (cb2.com). Rug AF-06, color: blue and ivory, Anastasia Collection. Loloi Rugs (loloirugs.com). Sofa Sven, color: Charme Tan. Article (article.com). Entryway Chandelier Petaluma. Park Studio (parkstudiola.com). Home office Clock Tanker. Schoolhouse Electric and Supply Company (schoolhouse.com). Desk Strut medium table, color: white. Blu Dot (bludot.com). Desk chair Panton, color: Basic Dark. Smart Furniture (smartfurniture.com). Storage cabinet Dang file pedestal, color: white. Blu Dot (bludot.com). Wall paint MQ5-54 Compass Blue. Behr (behr.com). Wall shelves Lack. Ikea (ikea.com). Kitchen Counter stool Hot Mesh, color: black. Blu Dot (bludot.com). Countertop Ella, Marble Collection. Cambria (cambriausa.com). Faucet Single handle pull-down, finish: Champagne Bronze, Trinsic Collection. Delta Faucet (deltafaucet.com). Floor tile Star, Pacific Collection. Cement Tile Shop (cementtileshop.com). Knobs Faceted Ory. 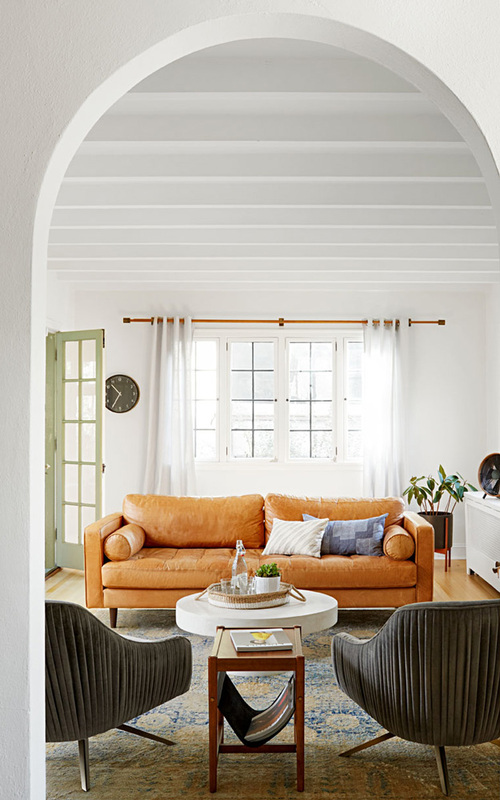 Anthropologie (anthropologie.com). Pendant Luna. Schoolhouse Electric and Supply Company (schoolhouse.com). Range Cormatin. Lacanche (frenchranges.com). Wall paint OC-17 White Dove. Benjamin Moore (benjaminmoore.com).